Happy Earth Day! We are so lucky to live on the Island...thinking green is in some ways is a "no brainer". Wisconsin has a place in this event. Gaylord Nelson, former Governor and Senator, helped to organize the very first Earth Day in April of 1970. The sign above takes on new meaning when one lives on an Island. Meaning ... disposing of "things" in general can be a challenge. It's not easy to find a place...thought and sometimes creativity is needed. Stressing the positive, in some ways, "recycling" can become memorable. A lovely teacup is a nice way to enjoy some green and raise a few cuttings. 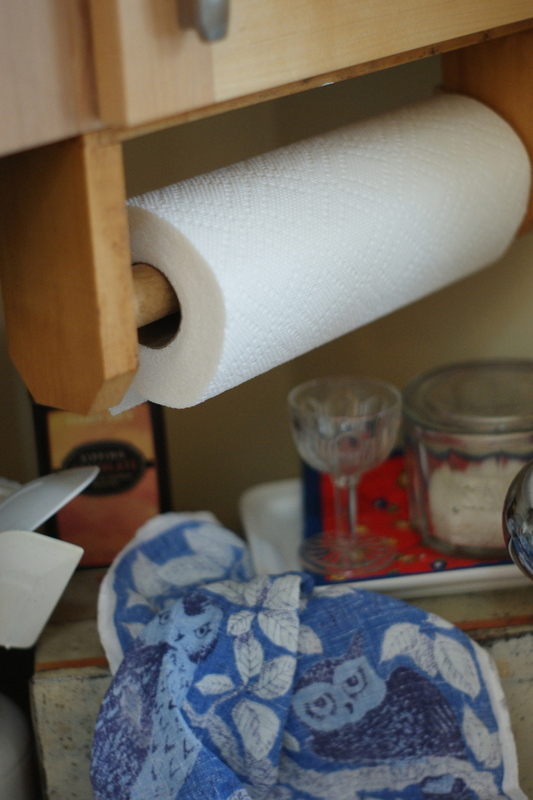 I remember when I found this paper towel holder at Marilyn Domer's estate sale. We were building a home on the Island at that time and I needed one. Talk about a good fit. The tea towel and tiny glass were hers as well. Feels good to have a bit of this wonderful woman as a part of my home. Marilyn was special. While on this "green" train of thought... A couple of weeks ago I was rummaging around the garage and came upon a pot hastily brought in at the end of the season. I thought it was cleaned out but I guess it wasn't. Nearly translucent spikes were struggling upward, so ugly I didn't think to take a photo...merely dropped the pot off on the porch. When I checked a day or two later, I was surprised how a few hostas could seem so refreshing! Saving and using again was a way of life growing up. I remember a cupboard which held a growing collection of empty Mason jars. My Mother and Grandmothers would reuse them every year to can vegetables or make preserves. There is nothing like a bit of bright fruit flavor to bring back Summertime thoughts, especially when there is a layer of snow on the ground! Lots of folks here use and reuse glass jars etc. to hold wonderful maple syrup, home relishes... yes, jams & jellies too! Some very talented people continue to keep these traditions alive. Had a thought of another group that helps find places for good things...sort of... more along the lines of adopt rather than buy... am thinking of the Door County Humane Society. Located in Sturgeon Bay, they help cuddly critters as well as those who love pets all the way to Washington Island. Meet Hanna, a truly wonderful 5 year old chocolate lab mix. She is bright, likes children, frisbees and car rides. So here's a last look at those lustrous green hostas...a week later. These little things do renew my patience for Spring's arrival... Happy Earth Day! This week: Another sign of the season changing ... Danish Mill reopens this week - Thursday, April 25 @ 7:00 am. Regular schedule - Monday thru Saturday 7 to 3 ...yum, yum, yum! Saturday - April 27 - Washington DC Benefit Car Wash - @ the School and the 60th Annual Island Party @ Karly's. * Thanks to the Door County Humane Society for use of the photo and background info.